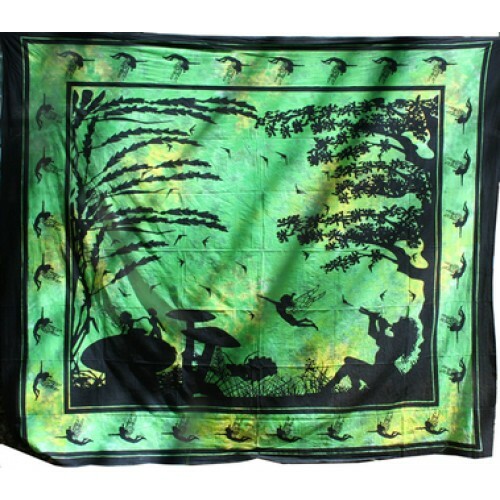 The Fairy Scene is one of our most popular tapestries. 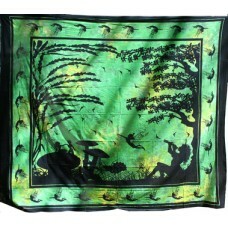 Only available in green at the moment, the scene evokes a simple, peaceful day, with light hearts and light music. At roughly 7'x8', it is sized to fit a Queen Size bed, but really can be used anywhere - hang it on the wall, throw it over a chair (or any other furniture), use it to divide a room, use it as a curtain - the possibilities are only limited by your imagination. All of our tapestries are 100% cotton, machine washable, and pre-shrunk.